Terriers are on the road for the Hockey East Quarterfinals taking on Lowell in the best-of-three series at Tsongas Arena. Game one on Friday begins at 7:15 p.m. and will be live-streamed on FloHockey pay-per-view. The Friends of BU Hockey is sponsoring pre-game gatherings for Terrier fans tonight and tomorrow night at BeerWorks at 203 Cabot Street in Lowell. Defenseman Alex Vlasic, one of four BU 2019 recruits on the NTDP U18s, talked with NHL.com about his efforts to amp up his offensive game and add muscle to his 6’6” frame. Vlasic, whose cousin is San Jose blueliner Marc-Edouard Vlasic and whose sister is a senior forward at Yale, has 24 points in 47 games. A strong prospect for the 2019 NHL draft, he’s been ranked #25 by NHL Central Scouting, #30 by Future Considerations and #23 by TSN. Vlasic and fellow Terrier commits Dom Fensore, Case McCarthy and Trevor Zegras will play in the IIHF World U18 Championships in Sweden next month. 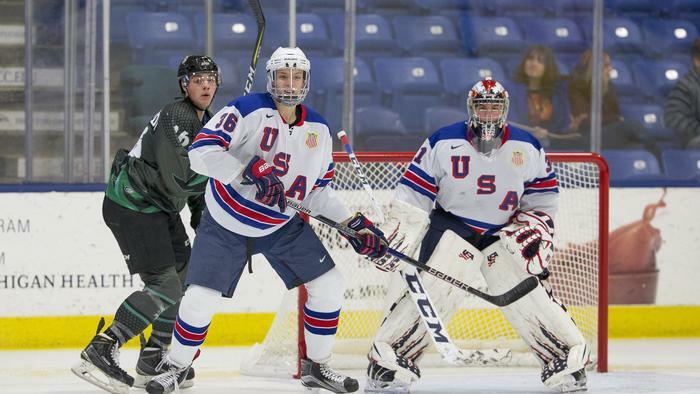 Three of BU’s 2021 recruits have been invited to the NTDP Evaluation Camp. Forwards Jeremy Wilmer (North Jersey Avalanche) and Tyler Boucher (Avon Old Farms) and defenseman Roman Schmidt (Don Mills Flyers) are headed to Plymouth, Michigan for the four-day camp beginning March 22. Wilmer and 2022 recruit Devin Kaplan of the North Jersey Avalanche 16U will be participating in the USA Hockey Tier 1 16U Nationals in Grand Rapids, Michigan, beginning April 3. Charlie McAvoy fires home his sixth goal of the season. Charlie Coyle scored his 11th goal and Charlie McAvoy fired his sixth but the Bruins fell to Winnipeg, 4-3. Alex Chiasson scored his career-high 20th goal in Edmonton’s 6-3 loss to the Devils. Evan Rodrigues, who went undrafted and reached the NHL as a free agent, is the subject of a New York State Lottery “What Are the Odds?” vignette. As a senior at BU, Rodrigues was second in the nation in scoring (61 points) behind Hobey Baker Award winner Jack Eichel and scored a pair of goals in BU’s 5-3 win against Minnesota-Duluth in the 2015 NCAA Northeast Regional championship game. With Eichel serving a two-game suspension, Rodrigues takes his spot tonight on the Sabres' top line against Pittsubrgh. The @NWHL’s leading goal scorer, Maddie Elia, has been named a finalist for MVP!